Steve and I are always trying to find ways to incorporate more veggies into our diet and we’ve been on a cauliflower kick lately. We’ve made a cauliflower pizza crust…yum; and now we’ve made this AMAZING soup…I think it’s just as good as the fennel kabocha squash soup that we make, but this soup cooks up way faster. The hazelnuts really give this soup a rich, creamy texture. It’s perfect for this cold, winter weather we’ve been having in Bend. 1. Toast the hazelnuts in the toaster oven or regular oven. Our toaster oven gets nice and hot and it took less than 8 minutes to get them a nice golden color. Be careful not to overcook (ie. burn) the hazelnuts. Once the hazelnuts are toasted remove the skins by rolling them between your hands. 2. Heat oil and butter on medium in a large soup pot. Add shallots and saute until soft and then add garlic being careful not to burn the garlic. 4. Now it’s time to add the chicken broth. Start with 5-6 cups. Bring it to a boil, then let it simmer uncovered for about 20 minutes. Depending on how much liquid cooks off you may want to add another cup or two of broth, so your soup won’t turn out like baby food. 5. 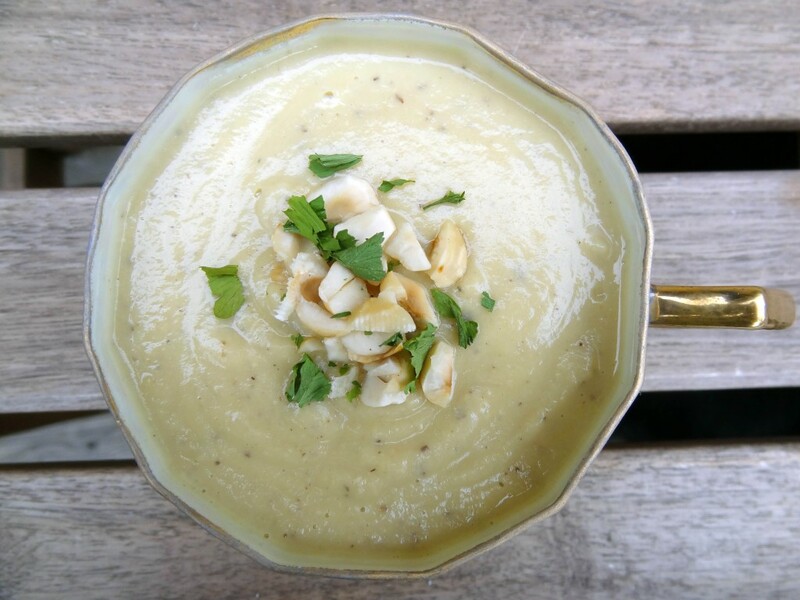 Once the cauliflower is tender and the broth has simmered down let it cool slightly, then add it to your blender or food processor with the toasted hazelnuts. Blend until the soup reaches your desired consistency. We were able to put the entire batch into our blender, but it might be necessary to blend in batches.